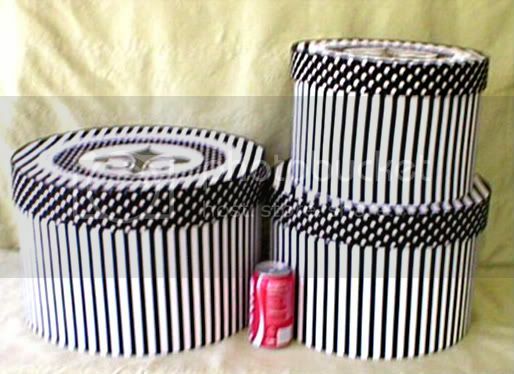 This is an enormous set of 3 XXLG, Tall hat boxes covered in Black and White striped and polka dot fabrics. 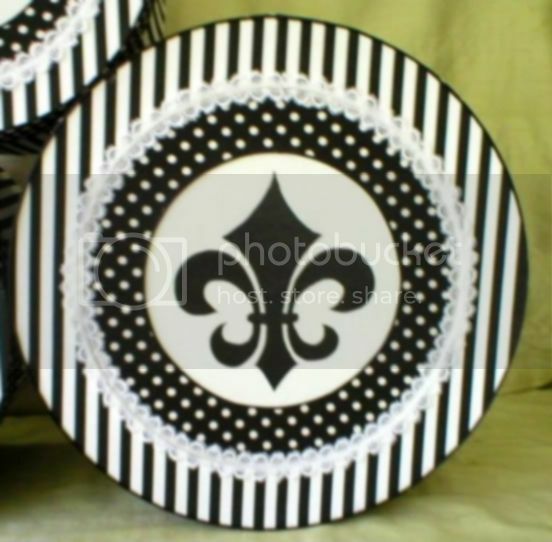 The center of each lid features a black fleur de lis hand painted onto fine white cotton fabric. Each center is surrounded by a center ring of black and white polka dot fabric and an outer ring of black and white striped fabric. The edges of the rings are finished with narrow Satin cord and double rows of white Venice Lace. DIMENSIONS: Small 12" across X 8 " height. Medium: 14" X 10", Large: 16" x 12". All our boxes are constructed in our pet and smoke free work shop. We also do custom orders upon request.